LUBBOCK, Texas (AP) Mason Rudolph kept No. 15 Oklahoma State from having to worry about another go-ahead field goal try from shaky kicker Matt Ammendola. The Cowboys quarterback ran 16 yards for the go-ahead touchdown in the final two minutes and Oklahoma State beat Texas Tech 41-34 on Saturday night. Rudolph’s second rushing score after halftime followed three first-half TD tosses as the Cowboys (4-1, 1-1 Big 12) bounced back from a home loss to ninth-ranked TCU and avoided a second early conference loss in their pursuit of the revived Big 12 championship game. Oklahoma State held the Red Raiders (3-1, 0-1) to 384 yards, about 200 yards below the third-best average in the county coming in, and stopped Texas Tech after Ammendola missed an 18-yard field goal that would have given the Cowboys the lead with 5:30 remaining. Ammendola missed a 22-yarder at the same end in the first half. Rudolph led Oklahoma State’s 79-yard drive to the decisive score. Marcell Ateman made a jump-ball catch over Octavious Morgan for 26 yards on third down. Two plays later, Rudolph faked a handoff and ran untouched to the right corner of the end zone with 1:12 remaining. Nic Shimonek completed a 25-yard pass to Antoine Wesley at midfield before four straight incompletions that clinched the win for the Cowboys. DaMarcus Fields returned an interception 95 yards for Texas Tech’s first points , and Justin Stockton and Desmond Nisby had consecutive 1-yard runs to get the Red Raiders even after they trailed 34-20 going into the fourth quarter. Justice Hill had a career-high 164 yards rushing for the Cowboys along with a 5-yard scoring catch. James Washington had nine catches for 127 yards and a score and now leads the nation with 627 yards receiving. Ateman had 114 yards receiving. Rudolph was 27 of 38 for 376 yards, with first-half TD tosses to Washington, Hill and Jalen McCleskey. His first rushing score was an 8-yarder on the opening drive of the third quarter. Shimonek was 29 of 46 for 330 yards with one touchdown and just his second interception of the season, a costly mistake on an ill-advised screen pass that went directly to defensive end Jordan Brailford at the Oklahoma State 15 with Tech trailing 34-27 after a successful onside kick early in the fourth. Oklahoma State: There could be room to climb in the poll with No. 12 Virginia Tech’s loss to Clemson. It’s not the situation the team wanted approaching the midway point of the season, but it’s better than the alternative – a second straight loss after peaking at No. 6. 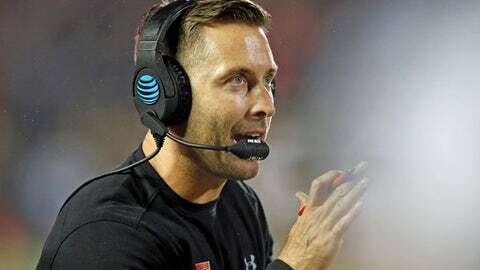 Texas Tech: A win likely would have meant the Red Raiders’ return to the poll for the first time since Kliff Kingsbury’s first season in 2013, when they started 7-0. Instead, they’ve lost 13 straight games to ranked opponents under Kingsbury, all since 2014. Oklahoma State: The Cowboys held up their end of the matchup with the Nos. 3 and 4 offenses nationally in total yards. Oklahoma State outgained Texas Tech 597-384, surpassing its average by 17 yards. But Rudolph’s overthrow leading to Fields’ long interception return kept the Red Raiders close early. Texas Tech: The Red Raiders twice settled for field goals with first downs inside the Oklahoma State 5. Those eight lost points loomed large in a seven-point loss. Oklahoma State: Winless Baylor on Oct. 14 after an open week. Texas Tech: After three of four at home, it’s time for three of four on the road. The first is at Kansas on Saturday.